Need to keep your small form factor build cool under the pressure of PC gaming? Then our 5 best low profile CPU coolers are exactly what you’re looking for! Cooling plays two vital functions in any computer or electronic. First, it helps your hardware achieve the highest level of performance it can. Secondly, it prevents your hardware from overheating and damaging itself. With better cooling comes better performance and a longer lifespan for your computer hardware. However, cooling in smaller cases can quickly become a challenge since the small form makes it quick to overheat and hard to fit in as many fans. Getting the best low profile CPU cooler is an important part of making a great small form factor PC. Whether you’re building a compact gaming rig or a simple work computer we’ve rounded up our top five low profile CPU coolers and reviewed every one of them to give you a clear idea of which one is right for you. Noctua is an Austrian company known for making very high performance and quiet, although not very visually appealing, fans. Their meticulously engineered fans operate to a high standard but until more recently only came in a pretty unwelcome two-tone brown color scheme. 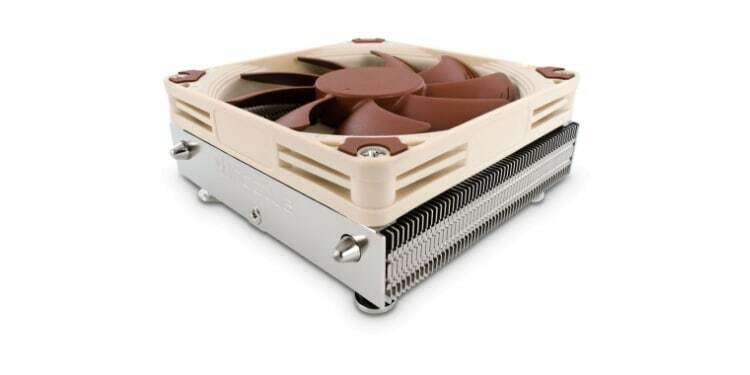 Noctua also offers coolers that are known for having equally unparalleled levels of performance to their fans being both silent, powerful, and in this case very small. The Noctua NH-L12S is a small CPU cooler that offers performance well above the level of standard low profile cooling. For starters it offers around 165 watts of thermal design power, meaning it can handle even Intel’s meanest processors and most of AMD’s without any problem as long as it has proper airflow. What’s even more impressive is that it is able to achieve this level of cooling while only coming in at 70mm in height and producing a maximum of 23.9 decibels. This is a low enough noise level that even when running at full blast it will still be inaudible in your average room. Ultimately, the only complaint we have about this product boils down to the same complaint many people have with most Noctua products: it doesn’t look very good. If you’re looking for a cool CPU cooler and your case has a large side panel window, then maybe this isn’t the cooler for you, but if you simply want impressive performance and silent operation in a small form factor, then the Noctua NH-L12S certainly delivers. The first cooler we looked at might have been a bit of a let down for RGB fans, or anyone who’s on the lookout for the best looking cooler. Luckily, the next cooler we’re looking at flaunts a unique design that looks like something that’d power Tony Stark’s next Iron Man suit. The Cooler Master MasterAir G100M’s unique design isn’t just for looks though as the large shroud actually funnels the air from the fan downward onto the large copper cooling column in the middle of the heatsink. 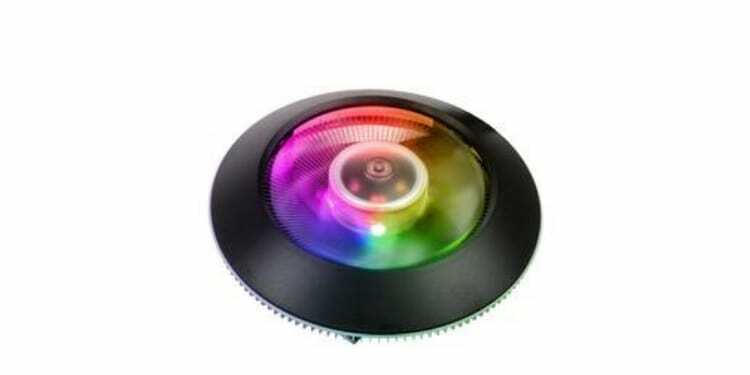 This gives the cooler a UFO-esque aesthetic, which is especially apparent with the built-in RGB lights giving off their radiant glow through the fan. 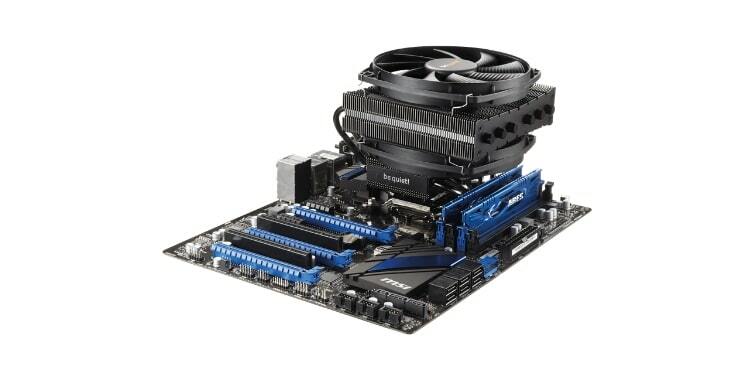 This cooler is short enough to make it a good mini ITX CPU cooler, but it is important to keep in mind that the design of this cooler can block some RAM from fitting into some motherboards. Due to the fact that the cooler gets wider towards the middle, it can potentially encroach on some taller RAM modules, especially if your motherboard has the RAM slots especially close to the CPU socket. That said, this cooler offers stronger performance for its size with 130W of cooling while running at 30dBA. While 30dBA is certainly not loud, it does make this the loudest of the coolers featured on our list. As their name implies, be quiet! is known for producing excellent and quiet CPU fans, coolers, and even cases (their cases make no noise at all… they just sit there). From their lineup, we present the Dark Rock TF, a relatively low profile cooler that offers powerful performance with minimal noise. All of the Dark Rock series of coolers sport a unique look with the most glaring (in a good way) aesthetic choice being the use of a black finish on the metal of the coolers. This makes their coolers look great in almost any PC even without any RGB. When it comes to performance, this is hands down the most powerful cooler on our list with a thermal design power of 220 watts making it not only appropriate for practically any CPU you could want, but even for some overclocking with proper airflow. The main reason for all of this high-end performance is the heatsink’s two-tier design that incorporates six heat pipes that feed into two fin arrays which are cooled by not one but two fans. On top of that, this cooler manages to offer this level of performance while only capping out at 26.7 dBA of noise, which is very inoffensive. The drawback to this complex multi-layered and multi-fan design? It’s not only the most powerful CPU cooler on this list (yay! ), it’s also the largest CPU cooler with a height of 130mm, which is bad for a low profile CPU cooler… In fact, some might argue it’s a stretch for the definition of low profile-- it very well might not fit into all cases-- it’s still a great option if you have space and need the cooling. Next up is another cooler from industry leader Noctua, but this one features a much simpler design. 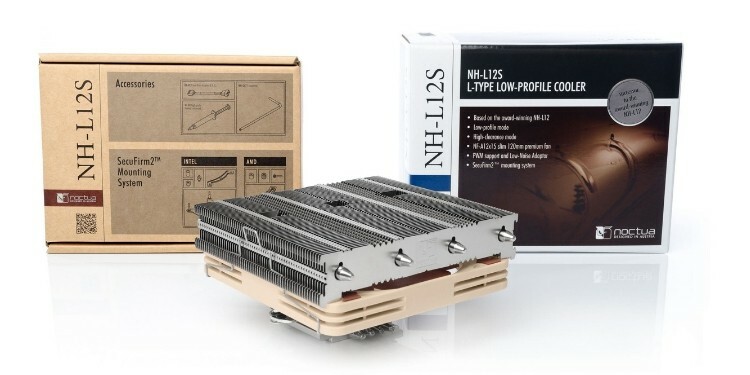 The NH-L9i is pretty much as basic as you can make a CPU cooler and is constructed from a single small array of cooling fins with a couple of heat pipes running through them with a low profile CPU fan on top. Below the cooling fins are four small brackets that can be screwed onto the motherboard to mount the cooler. This design means that the cooler cannot use different brackets for mounting and is therefore pretty limited in regards to what kinds of CPU sockets it can fit on. This simple design allows the NH-L9i to achieve some decent performance with almost no noise in a very small form factor. Coming in at a mere 37mm with the fan included, this cooler will fit into practically any case and won’t interfere with any RAM or GPU space thanks to its design. This cooler offers around 90 watts of cooling depending on how good the airflow is inside the case. While this is enough for many CPUs, some will need more; if you’re overclocking, you’ll certainly want a more powerful cooler. Since the early days of computing, PC part manufacturers have been asking how they can make smaller CPU coolers. Thermaltake settled on an interesting solution to the question with the Engine 27, a cooler that has an all metal fan integrated into the heatsink itself. The inner fan portion of the heatsink sits inside a series of grooves on the cooling block portion of the heatsink. This allows heat to be transferred between them which accelerates the cooling process. 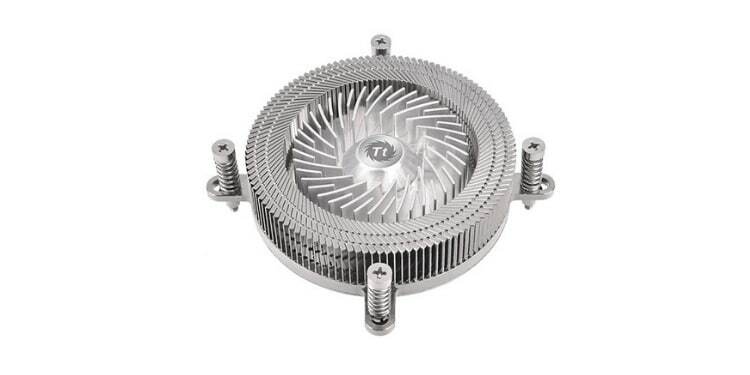 This all metal fan is driven by magnetic impellers in the middle of the heatsink. By designing the fan as part of the heatsink itself Thermaltake was able to produce an incredibly compact cooler, coming in at a mere 21mm in height. Despite its diminutive size, it still offers reasonably good performance for the size. In spite of having metal on metal surfaces that seem like they would make a lot of noise, this cooler only gets up to 25 decibels when under load. That being said, being the smallest on our list comes with some drawbacks. The Engine 27 is also the weakest cooler on our list, only able to offer a meager 70 watts of cooling power. This is enough for many CPUs but is even more limiting than the Noctua NH-L9i when it comes to overclocking. When it comes to picking a cooler for a small form factor built there are three main factors you always want to keep an eye on: TDP, noise, and size. Let’s take an in-depth look at each of these so you can make the best possible choice of CPU cooler. Thermal design power, or TDP, is the measurement of how much cooling power a given CPU cooler has. It is measured in watts of energy, which is the amount of heat that the cooler can actually dissipate, meaning that higher numbers equate to more cooling. When it comes to TDP it is important to remember that things change due to other factors as well and if your computer doesn’t have proper airflow and case fans then the coolers will operate less efficiently. Because of this, when choosing a CPU cooler you will want to check your CPU’s TDP and then get a fan that can handle a little more than that. In particular, Intel has been called out for giving all of their CPUs from a certain generation the same TDP as a spec when in reality people can easily see that’s not the case. You can use this website as a reference if you’re uncertain of your CPU’s TDP, or you can always just check your CPU’s manual. The cooler with the highest TDP on our list goes to is the be quiet! Dark Base TF which has an impressive 220W of cooling power. This means that this cooler could handle practically any CPU and even some overclocking. Another thing that most people find important to consider is the noise your cooler will produce. Ultimately, all of the coolers on our list are actually very quiet and even the loudest out of all of them only reach 30 decibels, which is about the same noise level as the average library. We say most people because technically speaking a loud fan doesn’t hurt anything except you… and that’s only via the power of annoyance. If you usually wear headphones while at your computer, then you likely won’t notice any of the coolers on our list. However, one of the most common uses for small form factor builds is in entertainment centers where even very quiet fans can ruin a viewing experience. If you’re looking for the quietest low profile coolers out there then look to Noctua. Both of the Noctua coolers we looked at come in at about the same sound level with less than 24 decibels of noise, which is in most cases inaudible. Naturally, the third thing to look at with low profile coolers is size. The most important measurement to keep an eye on is the height of the cooler, as this is usually where most coolers will interfere with your case. Looking in your case’s manual, or looking it up online, will show you how much clearance your case has for the CPU cooler; almost always in millimeters. It can also be important to make sure the size of the cooler won’t interfere with the RAM you are going to use either. If your memory modules are next to your CPU, then a cooler that’s wider at the top could get in the way. This is most important to be aware of with the Cooler Master MasterAir G100M.